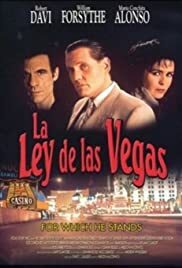 A Las Vegas casino owner, after an unwanted clash with a Colombian crime family member, becomes deeply engaged with several unsavory groups in his attempt to achieve safety for him and his family. Based upon actual incidents. To save his family he'll risk losing everything. Fame, fortune, his life... even his soul. The film starts of promisingly but after 20-30 minutes deteriorates into boring collection of scenes which include Johnny Rochetti (Forsyth) going from place to place and also other scenes which are supposed to be stylish directing but just don't work. The film is very boring and I don't think Forsythe's facial expressions change at all during the film. One high point in the film is the appearance of Ernie Hudson as a special agent who manages to actually put a bit of character in the film. If you want a good mafia/gangster film watch Goodfellas, Casino or Lock Stock And Two Smoking Barrels. You wonder why people bother making such dirge.